Why they exist and what you can do to keep your lawn healthy! Depending on where you live, you may or may not be familiar with fertilizer application restriction periods, commonly referred to as “blackout periods.” While some see blackout periods as an inconvenience, the majority has come to accept them as an important step in protecting our waterways and the environment. In this article, we’ll learn the science behind why blackout periods exist. We’ll also help you comply with local and state ordinances by giving you tips that will help you keep your lawn a vibrant green during these blackout periods. Blackout periods are a time frame when fertilizers containing nitrogen and/or phosphorus are not permitted to be applied to turf, ornamentals, or a variety of other plants. Most blackout periods run from early June though late September and are located in tropical/subtropical climates. In the United States, the majority of blackout period laws are enforced on a county to county basis within the state of Florida. Florida blackout periods tend to correlate with the rainy season in this region. In the northeast/mid-Atlantic region, Maryland and New Jersey have their own set of blackout restrictions which run from Nov 15, through March 1. These blackout periods also correlate with this region’s rainy season. Water is the world’s most precious resource; without it, animal life suffers, and human civilization would not be possible. Blackout periods serve to protect our waterways for the greater good of our environment. In order to understand why blackout periods exist, let’s briefly brush up on our plant biology and ecology. All plants require primary nutrients for growth and reproduction. In most cases, nitrogen and phosphorous have the greatest impact on plant growth. If either of these nutrients are lacking in the soil, plants tend to suffer. In most soils, phosphorus is already abundant, however adequate nitrogen is lacking; that’s why most fertilizers contain high concentrations of nitrogen. Using turfgrass as an example, when turf is fed an ideal amount of nitrogen under ideal conditions (perfect temperature, adequate water, adequate sunlight), turf maintains a deep green vibrancy and healthy growth rate. The problem begins when freshly applied fertilizer encounters a multi-day rain event. Much of this water eventually ends up in lakes or bays, and with this water comes excessive amounts of wasted fertilizer that never had a chance of being taken up by lawns and target plants. 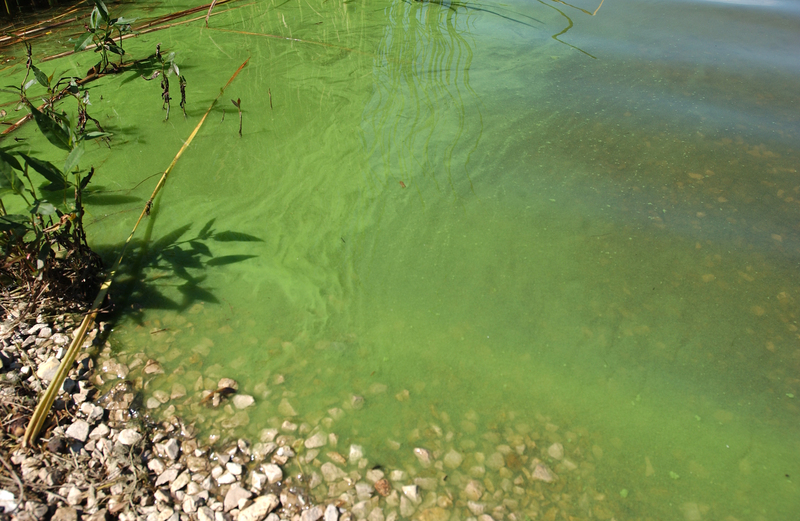 Eventually, large quantities of dissolved nitrogen and phosphorus collect in shallow lakes and bays, setting the scene for an environmental disaster caused by freshwater algae. 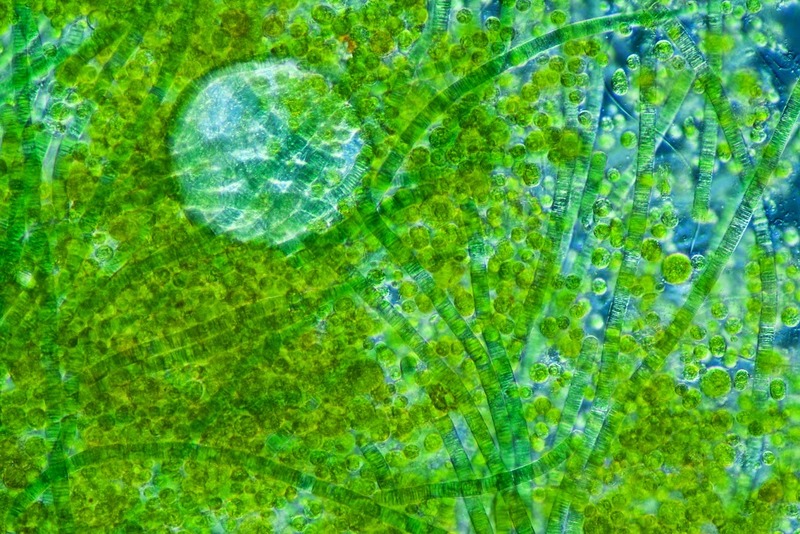 When algae, shallow water, sunlight, heat, and excessive fertilizer (mainly nitrogen and phosphorus) are all present, algae grow and multiply at an exponential rate, resulting in analgal bloom. 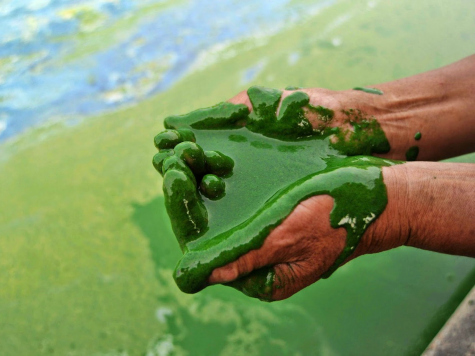 This process is called eutrophication, and the effects are devastating. As the water fills with algae, animal life (such as fish, frogs, mussels, etc.) suffocate. Bottom dwelling fresh water plants die off because the sunlight becomes blocked. This results in a large body of water being depleted of oxygen. Once the algae run out of nutrients, they die off in mass quantities and sink to the bottom. This results in a population spike of bacteria, and the bacteria begin to feed on the algal remains. These same bacteria also consume large quantities of oxygen, further depleting fresh-water bodies of already scare oxygen. Once the bacteria die off, dead zones may form in lakes and bays. 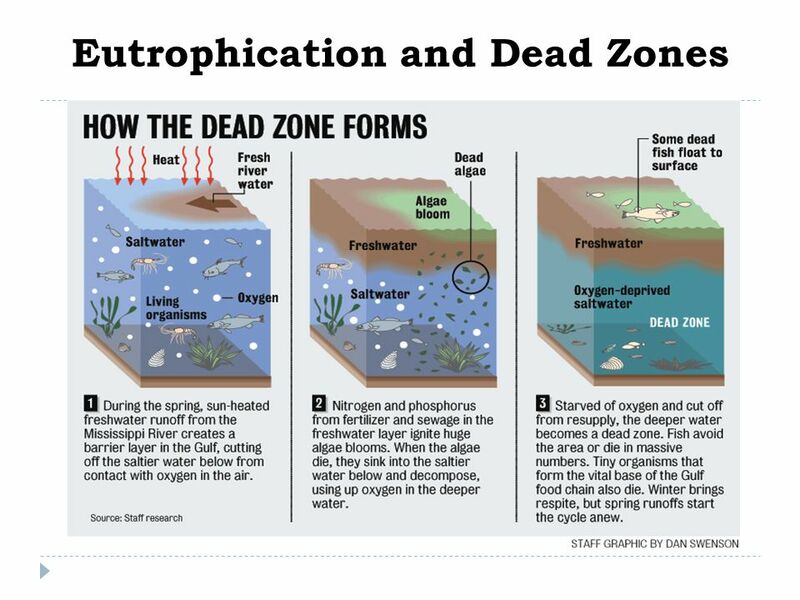 Dead zones are regions of water with very little oxygen that can support almost no aquatic life. Dead zones can take years, if not decades to recover from impacts of excessive fertilizer run off. 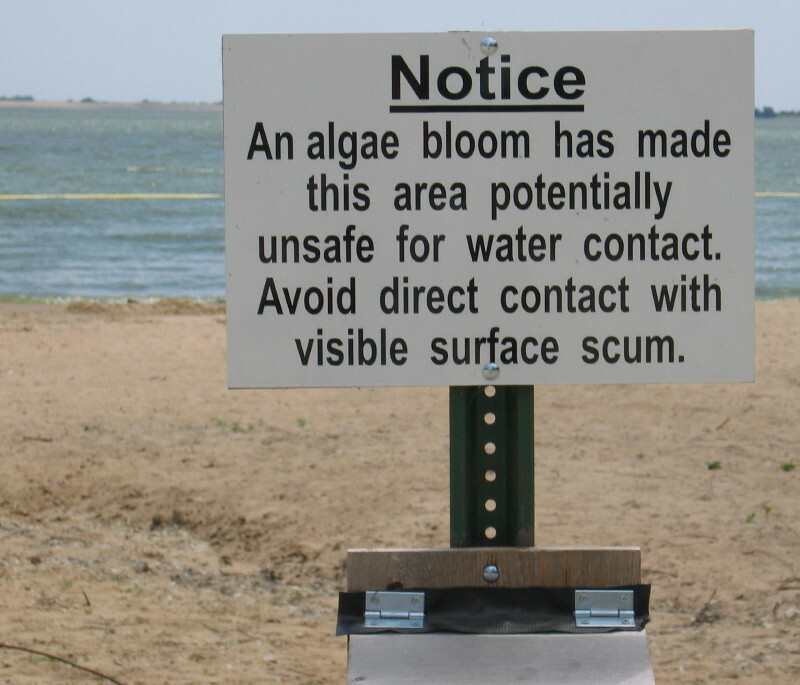 One of the most serious ramifications of fertilizer runoff is cyanobacteria (blue-green algae) blooms. 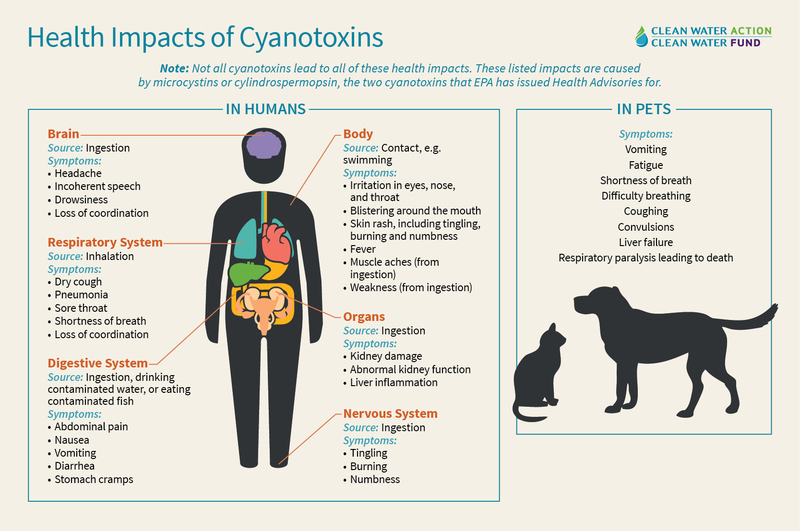 Cyanobacteria produce highly potent toxins called cyanotoxins. This large range of compounds has been shown to harm the liver, kidneys, reproductive system, and nervous system. Some cyanotoxins are believed to be carcinogenic (numerous studies are currently under way to validate these claims). When the concentration of cyanotoxins becomes excessive in drinking water, filtering these toxins out becomes challenging. In extreme situations, municipalities will warn residents not to drink from city water supplies due to the treatment plant’s inability to filter cyanotoxins down to safe levels. Whether or not an individual chooses to use fertilizer, the choices societies make regarding fertilizer use directly affect human health and the health of the environment. For all these reasons, many states have adopted regulations regarding the amount of nitrogen and phosphorus that can be applied to turf, ANDwhen these nutrients may be applied. (For example, in Maryland, no more than 0.9 lbs N per 1000 sq ft. may be applied at any given application, and no more than 0.7 lbs N per 1000 sq ft. may be readily available nitrogen). These rules exist year-round, in addition to blackout periods. Naturally, many disagree regarding the specifics of some of these rules, but in general, as our knowledge of the science behind fertilizer run-off and eutrophication improves, regulations are re-examined and revised accordingly. What can I do to keep my lawn healthy during blackout periods? Because blackout periods typically last 3-4 months, it is imperative to make your last fertilizer application prior to the blackout period as effective as possible. Suggestion: Before applying any fertilizers or soil amendments, check with your local, county, and state governments for ordinances regarding when and how much fertilizer you can put down in a calendar year. Use more slow/controlled release nitrogen. Polymer Coated Sulfur Coated urea (PCSCU, XCU, SCU, etc.) is designed to release nitrogen slowly and continuously throughout a designated time frame. Some slow/controlled release nitrogen products last 30 days; others- 90 days or more. Consider using a fertilizer blend where 75%+ of the total nitrogen in the bag is slow release. This may get you through most or all the blackout period. Deepen your lawn’s green color by supplementing it with an iron product. Iron sulfate– this is the most common source of iron; it provides a quick greenup and is relatively inexpensive.Be careful around concrete driveways and sidewalks as this product can stain once it dissolves in water. Iron sucrate– although a little more expensive than iron sulfate, this product also provides a quick greenup that can last several months. Iron sucrate is safer around concrete as it does not stain upon accidental contact. Add a soil amendment that conditions the soil to retain moisture and nutrients (which reduces leaching and volatilization).